Juicing seems to be the latest health craze. First, there was the cabbage soup diet, followed by the Atkins diet, gluten-free diets, the South Beach diet, the Paleo diet, and so on. Proponents of juicing claim it can help with a number of things, from weight loss to cleansing your system. Juicing has really taken off, but before you spend a fortune on a fancy juicing machine, make sure you're aware of the potential health risks and benefits. • Juicing is a great way to squeeze fruits and vegetables into your diet if you typically don't like them. 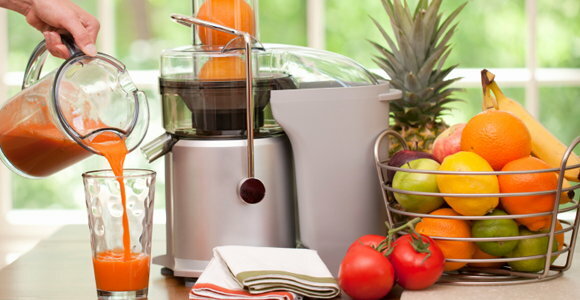 • When making juice, you can add fruits and vegetables that are about to spoil. That way, you don't waste produce (the food we waste the most money on each year). • People think juice is a nutritionally-equivalent replacement for whole fruits and vegetables, which isn't true. There are certain nutrients that whole produce will give you that you can't get from the juice, including fiber. The skin and the pulp of fruits and veggies are where the fiber and most of the vitamins and minerals are housed, and if you discard these parts, you're throwing out the most beneficial portions of the produce. • Juicers are expensive. They can range in cost from $50 to as much as $400. That's a lot of money to spend on one piece of kitchen equipment, especially when it serves only one purpose. A blender, on the other hand, can be used for a variety of foods but costs much less. • Juice, no matter where it comes from, is a concentrated source of calories. This is especially true if you use more fruits than vegetables in your juices. • The juice isn't pasteurized, which could be a food-safety hazard. Wash your hands and all produce before preparing juice. Drink juice within one week, preferably on the same day that you make it. Also, wash the juicer with hot, soapy water after each use. Juicing to lose weight or "cleanse" is not only unsuccessful, it can be downright dangerous. If you're drinking juices in place of real food, you'll fall short on a number of nutrients your body needs, namely fiber and protein. Fiber keeps us full for longer, preventing overeating. Protein also keeps us full and helps us build and maintain lean muscle mass, which burns calories even at rest. If you cut your calories too low because you're just drinking juice all day, your metabolism may slow down. Then, once you start eating solid foods again, you'll likely put on weight in the form of fat cells. Your body has two wonderful organs to do any cleansing you need--your liver and your kidneys. Freshly-prepared juice can certainly be incorporated into a healthy diet, but it's not a miracle food that's going to make you instantly skinny or cure whatever ails you. Additionally, be sure to talk to your doctor before starting juicing in order to prevent potential drug and nutrient interactions. This is because a lot of people use dark, leafy greens such as kale and spinach in their juice concoctions, and these greens are high in vitamin K, which could interfere with how certain blood thinners work. Kari Hartel, RD, LD is a Registered, Licensed Dietitian and freelance writer based out of St. Louis, MO. Kari is passionate about nutrition education and the prevention of chronic disease through a healthy diet and active lifestyle. Kari holds a Bachelor of Science in Dietetics from Southeast Missouri State University and is committed to helping people lead healthy lives. She completed a yearlong dietetic internship at OSF St. Francis Medical Center in Peoria, IL, where she worked with a multitude of clients and patients with complicated diagnoses. She planned, marketed, and implemented nutrition education programs and cooking demonstrations for the general public as well as for special populations, including patients with cancer, heart disease, diabetes, Alzheimer's disease, obesity, and school-aged children. Contact Kari at KariHartelRD@gmail.com.